Help : Try to allocate invoices to payments for a business partner or group. You may want to reset existing allocations first. The allocation is based on (1) payments entered with reference to invoices (2) payment selections (3) business partner balance (4) matching amount of invoice & payment. Allocation is based on exact amount and includes AP/AR imvoices/payments. 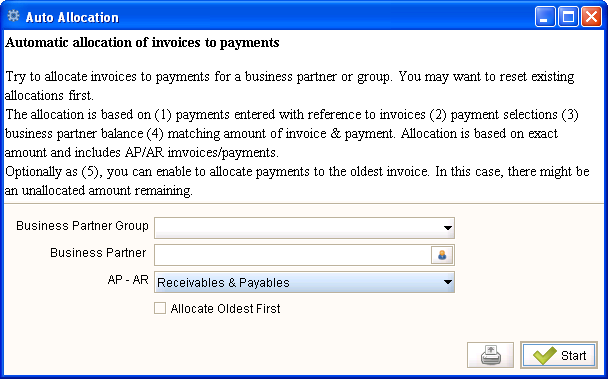 Optionally as (5), you can enable to allocate payments to the oldest invoice. In this case, there might be an unallocated amount remaining.